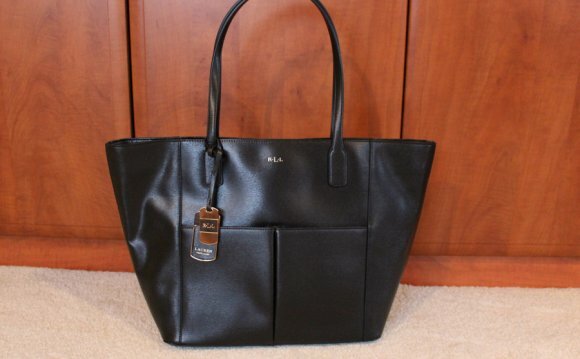 This Ralph Lauren Collection Ricky Tote Leather Small is one of the brand's most beloved styles. Crafted from dark green leather, this understated, elegant tote features a boxy silhouette, leather tab slide-lock clasp closure, reinforced sturdy base with leather tabs and silver-tone hardware accents. Its signature ricky lock closure opens to a luxurious black leather-lined interior divided into two open compartments with a center zip comparment and with side zip and slip pockets to hold your bare essentials. Its detachable strap allows this bag to be worn longer on the body for added versatility. Authenticity code reads 00003046 06/14 FALL2 435517061. Note Shoe photographed is used as a sizing reference, and does not come with the bag. These are professional pictures of the actual bag offered by us. ; Estimated Retail Price $1, 950; Condition Very good. Heavy scuffs on rear exterior, faint scuffs on front exterior, moderate wear on base corners, minor cracking on handle wax edges, slight stains in interior. ; Accessories Detachable straps, leather clochette with keys. ; Measurements Handle Drop 4.5, Height 7.5, Width 10.5, Depth 5, Strap Drop 21-23; Designer Ralph Lauren Collection; Model Ricky Tote Leather Small; Item Number 12328/01. Available in multiple colors and sizes.